Everything in Studio Ninja revolves around jobs. A job is like a folder which stores all the information about a job including quotes, invoices, questionnaires, contracts, notes and emails. In Studio Ninja, a lead is any job that hasn’t been confirmed yet. As soon as you create a job, it is considered a lead until it hits the Job accepted stage of the workflow. Job accepted is the point during which a lead becomes a confirmed Job. your client accepts a quote. your client signs a contract. your client pays an invoice. if you manually tick this task in the workflow. Using workflows (under Settings > Workflows), you can create a Lead Workflow that has tasks reminding you to call this client or book an appointment. For example, this task can be called “Follow up” and given a due date 2 days after Lead Created. 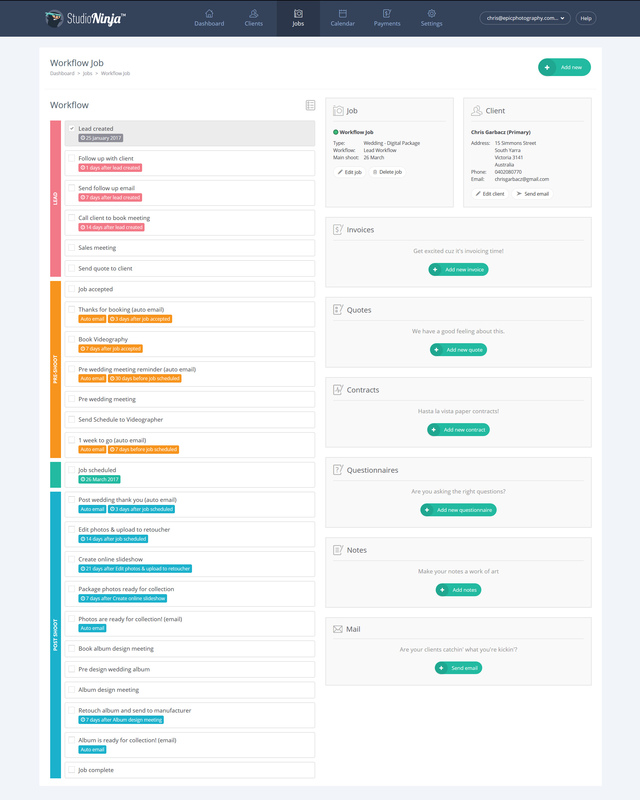 You can schedule these tasks in the pink “Lead” stage before the “Job Accepted” task, and assign this Workflow to any Job. We recommend that you use the Studio Ninja Contact Form builder, which allows you to embed the contact form on your website. When a prospective client submits an enquiry via this contact form, you will receive an email notification, and a new client will automatically be added to your Clients Overview. Currently we don’t yet have the ability for an auto-responder after your client fills out the contact form. That said, you can customise the thank-you message so that it sets your client expectations around your response time. You can then sign into Studio Ninja and create a new Job for this new client. After you have assigned a Workflow template to this new Job, the Lead tasks (workflow tasks with due dates) will kick into action, and a red flag will appear next to the task in your Jobs Overview if you haven’t done the task on time.